Seaport city in northwest Russia located on the White Sea (Белое море), also known as Archangel. The White Sea is an arm of the Arctic Ocean. A city in western Russia and the administrative center of the Pskovskaya Oblast (Псковская област). A city in southwest Russia and the capital city of the Chechen Republic (Чеченская Республика). Also it should be pointed out that грозный is a word which means formidable, menacing, severe, or cruel. A city located in western Siberia on the Ob River. The Ob River flows to the north until it reaches the Arctic Ocean. 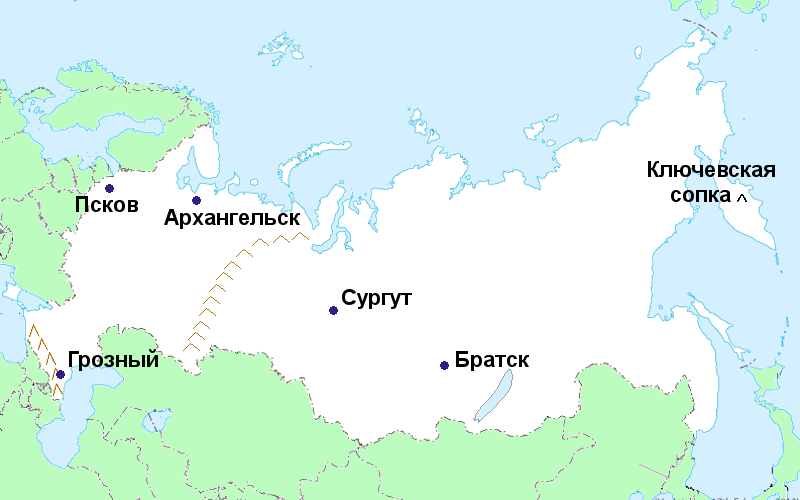 A city with a population of about a quarter of a million people located in southeastern Siberia on the Angara River. The highest active volcano in Eurasia and the highest mountain on the Kamchatka Penninsula (полуостров Камчатка). Incidentally, сопка means hill or mound. Ключевская сопка является действующим вулканом. Белое море является подразделением Северного Ледовитого океана.